Mission Hills has been carved from rubber plantations and sits among Phuket's environmentally-friendly mangroves. Great expanses of white sand beach bunkers have been added to contrast with the translucent blue hues of the ocean and the vibrant greens of the Sea Isle grassed fairways and putting surfaces. It is accurately described as a “piece of living art,” the kind of pastiche that Vincent Van Goh would have created given half a chance and a love of a long drive. The ocean views are delivered at a price: water comes in to play at seven holes. The sea breezes also are a regular feature. What time of day you choose to play can turn a following zephyr into a stiff headwind. While the spa awaits at the 19th hole, stress and tiredness are further banished with caddies and golf carts both being compulsory. It is not unknown for snacks to be delivered out on the course at lunchtime. Mission Hills might be by the sea but it is not a links course. 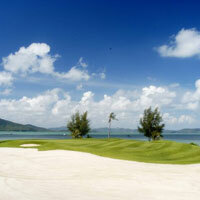 It actually bears no similarity to other courses on the island but probably reflects Phuket's character most accurately. Nicklaus Design has added some distinguishing quirks, like the two greens that offer alternative finishes on Hole 18. Paspalum Sea Isle grasses add stunning colors and thrive in the salty soil.